If the calls are being dumped to voicemail they're not helping the deliveryman on your doorstep, making the Google Voice number pointless. Requiring a phone number is going one step too far. I agree with CDTraveler on the issues on giving out personal numbers, which is why I have a google number set up for that purpose. At this time of year, I set it to pre-screen my calls, where the call records their name and then it rings me so I have the option of accepting or declining the call. There is also an option of having it ring a directly if you prefer. The setting can be changed back to dumping to voicemail once you are not expecting deliveries/after the holiday season. I've found my google number immensely useful for screening out spam and other unwanted calls. Most delivery companies such as FedEx are used to the whole idea of google numbers and leave messages with their dispatch center's callback number for easy scheduling. According to tracking info from the USPS site, my giftee's presents arrived one day last week. I certainly hope they make this year's Christmas all the more fun for my Santee! 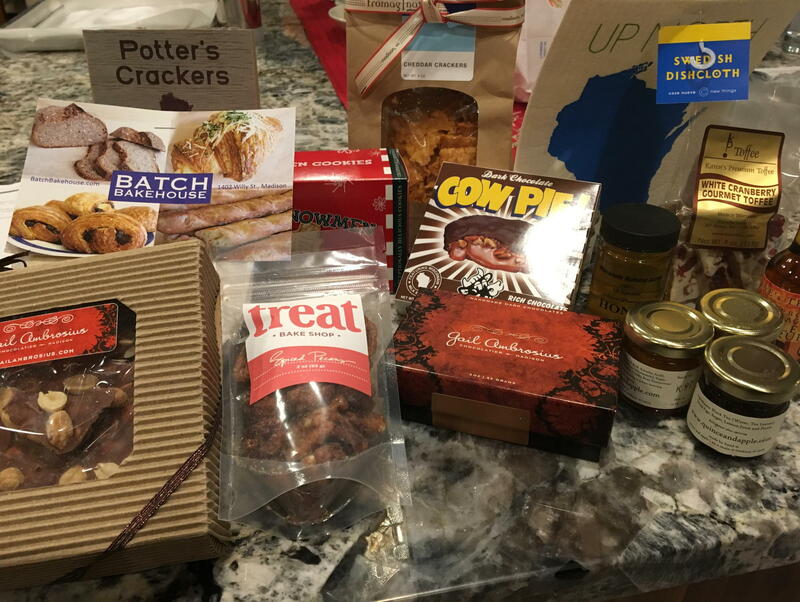 Thanks John for the wonderful Wisconsin goodies. USPS tried being a Grinch by delaying the delivery by four days, thankfully all is well. I've never been to "America's Dairyland" so I will enjoy the honey, jams, cookies, chocolates even more! All my gifts were purchased and mailed yesterday. A couple of my santees were really fun to shop for this year. Sent two more packages today. Last one either going out this afternoon or tomorrow! Anxiously awaiting from my next 3 Santas - already received from my 1st. I love this stuff! Today I received a package from my Santa in Plano, Texas. Saving it to open on Christmas Eve. 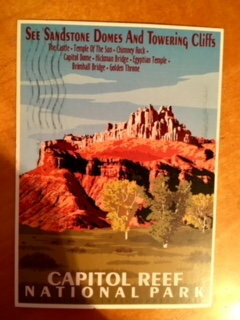 Today I got a tantalizing post card from my Secret Santa, who told me he/she bought me gifts while visiting the national parks of Utah! I am very intrigued! I received a box the other day. In it, was another box. Russian nesting boxes? The Santa that sent me the Turkish Delight left a note saying that further presents would arrive from California. Santa Wharvey has confirmed that these are from the same Santa. Inside that box was a bunch of wrapped boxes. What could they be? As an impatient kid, I was often told to wait until Christmas morning to open my presents. As an impatient adult, there's no one to stop me. HAH! The first and second presents were a Kingston WiDrive and a fad toy. The third present was Finnish coffee. Mmm! The fourth present was a travel charger. And when I went to throw the wrapping paper away, I found this keychain charger in the paper. Oops! Thank you very much, Santa! Are you related to Kipper? One of my packages has been picked up from the post office. Had to sort out a mishap with Canada Post but all is well with it now. To that secret santa, I apologize for causing you some anxiety about it! Waiting for the other package notification. I will be away until December 14th but will post pics when I get home and they're unwrapped! LOL! Considering that I have yet to receive any packages for this, I'm guessing all of my Santas are either waiting to ship, or have taken advantage of the secondary address I provided.